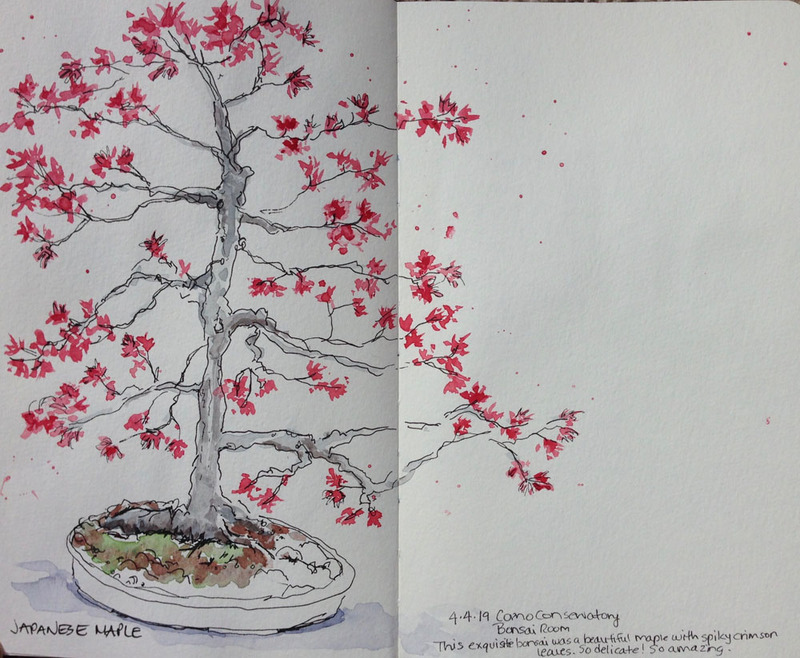 Last week I sketched at the Bonsai room at the Como Conservatory. This room has tables set up that overlook the Japanese garden. There were several beautiful bonsai trees there, and many were in bloom! I typically have seen them when they just have leaves, not flowers. I saw several tiny azalea bonsai trees and then saw this amazing Japanese Maple! I think I read that this tree had been training since 2011. The crimson leaves were little spikes and absolutely exquisite! I just had to sketch it. It was growing in a flat pot of pebbles and moss, and its spindly branches had beautiful clumps of leaves. Another woman was taking pictures and I learned that she was going home to sketch from her photos! Everyone seemed taken by this work of beauty. I sketched with a pen first, just getting down the tray, trunk, and branches. I allowed my pen to meander around, enjoying the texture and delicate branches. I ran out of time, so filled in the watercolor at home. Next Sketch Challenge— 100 people in 5 days!